Victor Serge , Unforgiving Years. Born in Brussels into a family of Russian anti-tsarist émigrés, Victor Lvovich Kibalchich left home at age 15. He became an anarchist and moved to Paris, where he began to write and publish articles in newspapers. He was imprisoned for several years as a terrorist and after his release, went to Spain. It was about this time that he took the pen name Victor Serge. After the overthrow of Tsar Nicholas II, he decided to go to Russia, where he began to question the Bolshevik regime. He was expelled from the party, arrested as the leader of a "Trotskyite conspiracy," and eventual thrown out of the Soviet Union. Soviet agents continued to follow him for the rest of his life. Serge wrote several works of nonfiction, collections of essays, poems, and novels. His health weakened by years of struggle and poverty, he died of a heart attack in Mexico City in 1947. His book Memoirs of a Revolutionary, 1901-1941, was published in 1963. 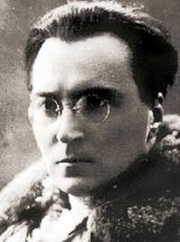 Victor Serge is currently considered a "single author." If one or more works are by a distinct, homonymous authors, go ahead and split the author. Victor Serge is composed of 4 names. You can examine and separate out names.